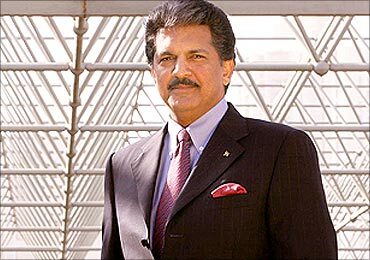 Mahindra & Mahindra vice-chairman Anand Mahindra on Monday offered to resign from the board of NACIL that runs state-owned carrier Air India, citing conflict of interest. In a letter to Civil Aviation Minister Vayalar Ravi, he sought permission to step down from the board of National Aviation Company of India Ltd.
"The recently concluded Aero-India 2011 at Bangalore has thrown up business opportunities for my company Mahindra & Mahindra Ltd, which was a potential conflict of interest and thereby throw up questions of good board practice. Hence my request," the letter said. In March 2010, Mahindra along with Air Chief Marshal Fali H Major (Retd), Ficci secretary general Amit Mitra, Ambuja Realty Group chairman Harsh Neotia were inducted as independent directors to the NACIL board. the group to aspire to become a leading component player. "We are developing the capability to supply components to the major suppliers from where Air India sources its aircraft. "In view of this development and the favourable business prospects, which recently emerged for M&M's aeronautical business in Bengaluru, I feel that my continuing as a director of NACIL would not be in accordance with the highest standards of corporate governance," Mahindra wrote. In 2009, M&M had forayed into the aerospace business by acquiring 75.1 per cent stake each in two Australian aerospace firms -- Aerostaff Australia and Gippsland Aeronautics -- for Rs 175 crore (Rs 1.75 billion) and planned to make aircraft and allied components to service the global market.